Utagawa Kunisada/Toyokuni III (1786-1865) The 53 Stations of the Tokaido Road, Station #46, Shono Station, 1852. Oban. Probably one of the most successful editions of woodblock prints of all time, Kunisada’s inspired and justly famous series of actors and the stations of the Tokaido Road marries two of the most popular genres of ukiyo-e into one theme. Each print, some issued as pairs, depicts a half length actor portrait set against a background of a Tokaido Station scene. The choice of actor, role and landscape remains largely uninterpreted, although in some there are obvious puns and allusions intended. Kunisada didn’t bother to walk the route, sketchbook in hand. Instead he relied on Hiroshige’s prints of the various stations, in this case seemingly the recently published Hoeido edition of 1831 - 1834. Comparison with the Hiroshige shows how Kunisada has taken not only the exact landscape - its bending trees and distant rooftops - but also the driving rain and the figures of the peasants bent double into the wind. 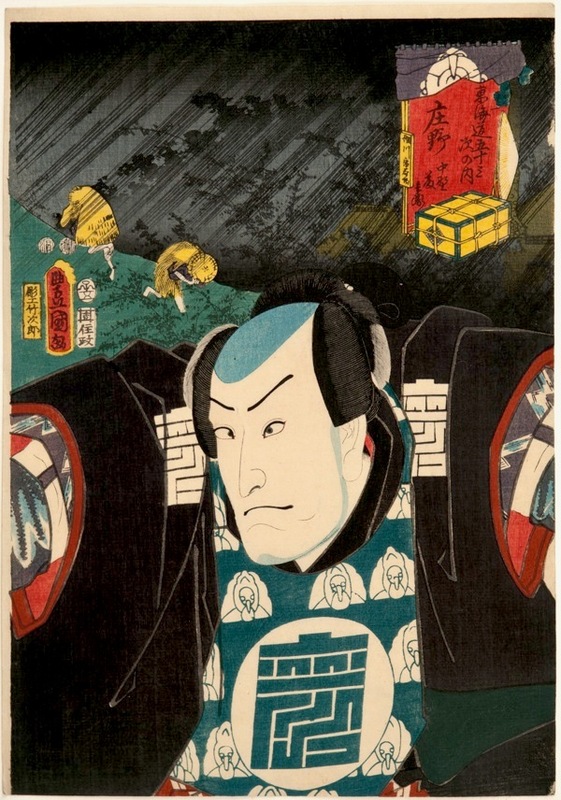 The portrait is of Bando Hikosaburo IV in the role of Nakano Tobei from a revenge play about the famous Soga brothers. This print is fabulous; rare in being full size and of the first edition. Kunisada’s interpretation of the Hiroshige landscape is extraordinary and the portrait is one of the finest and boldest of this famous series. An overwhelming design which plays subtly and inventively with the black and semi-tones of the inks making use of delicate shading and a near invisible series of toshidama in the burnished red of the cartouche. Published by Sumiyoshiya Masagoro, censor seals of Hama and Magome, dated rat/5.